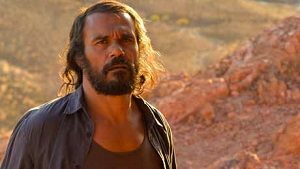 Ivan Sen follows up the accomplished Mystery Road with yet another slice of outback noir: Goldstone. Detective Jay Swan (Aaron Pedersen) is back, this time on the trail of a missing girl. The trail ends in Goldstone, a mining town – in the loosest sense of the word – in the middle of nowhere. Flat, dusty and punctuated with the occasional portable building, the town is a pretty inhospitable place. That’s before you meet the mayor (Jacki Weaver), mining company boss (David Wenham) and brothel mistress, Mrs Lao (Pei-Pei Cheng). It seems no one wants Jay poking his nose into their ever-so-shady business. To a certain extent, this is more of the same. Desolate setting, dodgy laid-back country folk who speak in single syllables, if at all. And of course, bubbling underneath everything is a steady current of racism. And front and centre is Jay, as the obstinate detective, never swaying from his task. One thing has changed, however: if, like me, you found the confusing narrative of Mystery Road frustrating, Goldstone swings the other way, with a story that’s laid out from the get-go. In fact, I’d say writer/director/composer Sen went too far: the story is sparse, with no surprises. The prequel was a little bit too much like The Big Sleep for me, a film that left my confused come the end credits. Goldstone, on the other hand, is positively pedestrian. Technically speaking, Goldstone is a towering achievement. It looks stunning, it sounds stunning. There are a number of birds-eye view shots of vehicles powering along the deserted highway – presumably with the aid of a drone camera – and they perfectly capture the bleak umber of the Australian outback. Sen’s score relies on a single piece of music that’s played half a dozen times, but it’s a tune heavy with tragedy, and perfectly accompanies the downbeat narrative. This film is frustrating, because it falls just short of great for me. It may have addressed some of the issues that bugged me with Mystery Road, but it’s brought with it new problems. The story is too simplistic, and the nature of the crime Jay’s trying to solve is basically a repeat of the first film. I love that these films exist, but they’re still not as impressive as they should be. The good news is that there’s further reference to those mysterious ‘super-dogs’ that were mentioned and never elucidated in the first film. Either it’s an ongoing metaphor or we’ll finally get an explanation in the next sequel. Goldstone is released in Australia on 7 July 2016. This entry was posted in Film Reviews and tagged Action/Adventure, Mystery, Noir, Thriller by Stuart Wilson. Bookmark the permalink.